12. Sign the Susya Petition! July 6th, 2007. At around 11:00, 60 Palestinian, Israeli, and international activists gathered in the trees in Um Salamuna above the place where the apartheid wall is to be built. There were Israeli Occupation Forces (IOF) on the hill across from us, watching while we happily wasted their weekend time. Palestinians and internationals gathered to pray, and afterwards we walked down chanting to where they were building the wall. We arrived to where the soldiers and border police were waiting and they tried to stop us from moving. We pushed forward and they pushed us back with their shields. We then sat down and chanted and clapped. The soldiers surrounded us and the mayor of the settlement on the hill watched us, smiling. One speaker said that the land they were on was his, and that his face was like stone, whereas the face of the mayor, from Russia, was like snow. We stood up and the police again formed a line, preparing to use their shields against us, but we walked the other way. As they stood in the dust we created, we walked across the road and began picking the grape leaves and almonds that belong to the Palestinians. After some time soldiers were making their way towards us, we heard sirens, saw dogs and the rest of the group on the road told us to come back as jeeps were approaching. We came off the Palestinian land on to the road and the site of the apartheid walls construction as a jeep was being blocked by our group in the road. We surrounded the jeep much to the dismay of the soldiers inside who at times tried to go through us but could not. Then we began to decorate the jeep with the grape leaves we collected by means of the netting on top. This unfortunately did not cover the jeep in beauty, but in shame. The other soldiers then approached, surrounded the jeep and pushed us away. We marched back to the top of the hill. No one was hurt, no one arrested, and we showed that people from Palestine, Israel, and all over the world will not stand by as Israel, illegally steals more and more land. July 6th, 2007. This afternoon, in the West Bank town of Bi’lin outside of Ramallah, approximately 70 demonstrators attempted to approach the annexation barrier which snakes through Palestinian land. The peaceful protesters included Palestinian members of the community, Israelis, and international observers from the International Solidarity Movement and the Scottish Palestinian Solidarity Campaign. Though the annexation wall has been completed in the area, the weekly protests against the wall have shown that resistance to the wall will not fade. As the protest began, with chants and flags waving, the marchers were not able to approach the wall itself; rather, the IOF had blocked the road with barbed wire, and as marchers tried to cross, the soldiers unleashed a volley of tear gas and rubber bullets. A young Palestinian was shot in the foot and an elderly man was rendered unconscious by the fumes. The IOF continued harassing the peaceful demonstration until the crowd dispersed. July 5th, 2007. Iraq Burin, a village in the Nablus region, has been suffering from increasing harassment by the neighboring illegal colony of Brakha. Villagers, many of whom are farmers, have owned the land for generations and are being frequently threatened by armed colonists. Beatings and shootings of farmers who attempt to tend to their fields have terrorized the village, preventing them from utilizing their land and making a living. Colonists have often burned fields and cut down the farmers’ trees. During harvest time, as the villagers labor to collect the olives for harvest, colonists descend upon the fields and steal the harvested crops under the protection of the Israeli Occupation Forces (IOF). These illegal colonies are in violation of international laws prohibiting the occupation of land and the obstruction of the economy of an occupied people. Furthermore, the criminal behavior of the colonists are provocations of these peaceful people. The IOF consistently protects the colonists by the use of armed force against these unarmed villagers. In response to these illegal acts, yesterday, the International Solidarity Movement planted 75 trees on land in Iraq Burin which had been subject to attacks by colonists and the IOF. Having obtained trees with the assistance of the Palestinian Agricultural Relief Committees and the Tanweer Organization in Nablus, international activists worked in conjunction with local farmers to plant the trees. The planting finished without any disturbance by the colonists or IOF who were within view of the operation. Ramallah, 04-07-07: Israeli soldiers shot dead a Palestinian child carrying a toy gun in Hebron yesterday. 15-year-old Ahmad Abed Al-Muhsin Skafi was shot 4 times in the upper body by Israeli soldiers who then allowed a military dog to maul the body, tearing the boy’s intestines from his stomach and mutilating his right hand. Palestinian National Initiative head Dr. Mustafa Barghouthi MP said that the killing was yet one more gruesome aspect of Israel’s ongoing occupation, in which children have been the all-too-frequent victims of Israeli military violence. He underlined that for every 6 Palestinians killed as a direct result of the occupation 1 was a child, adding that 798 children aged under 18 years old have been killed in Israeli military attacks since the Second Intifada began in September 2000, of whom 198 were under the age of 12. The majority were killed by shots to the head and/or chest using live ammunition, generally indicative of a deliberate ’shoot to kill’ policy. Israel is bound by international law to protect the Palestinian people whom it occupies, particularly children, who are afforded special protection under the Convention on the Rights of the Child , an obligation that Israel has repeatedly violated with impunity. Ahmad Ismael Muhammad al-Khatib, 12, of Jenin refugee camp, died in an Israeli hospital of head and abdominal wounds sustained November 3 from Israeli military gunfire while carrying a toy gun. Ahmed’s organs, donated by his father, saved the lives of three Israeli children and a 54-year-old Israeli woman. Mujahid al-Samadi, 15, of Qabatya, near Jenin, mentally disabled, killed by Israeli military gunfire to his chest while carrying a toy gun during an incursion. Rakan Abed Kayed Nuseirat, 16, of al-Auja, near Jericho, killed by the Israeli military at the al-Dyouk checkpoint while holding a toy gun on his way home. Dr. Barghouthi expressed little optimism towards Israeli military claims that an inquiry will be launched into Ahmad’s killing, saying that past investigations by Israel into its military’s conduct had been whitewashes. The Jerusalem Magistrate’s Court has sentenced nuclear whistleblower Mordechai Vanunu to six months in jail for violating the terms of his parole. Vanunu, a former technician at Israel’s nuclear plant near the southern town of Dimona, spent 18 years in prison for giving details of the country’s atomic program to British newspaper “Sunday Times” in 1986. The court’s sentence was unexpected, and even the prosecution expected the court to hand down a suspended sentence, meant solely as a deterrent. Vanunu’s attorneys, Michael Sfard and Avigdor Feldman, said before the conviction was handed down that the terms of their client’s parole order were unreasonable. After the verdict was announced, Vanunu said that his conviction proves that Israel is still ruled, in effect, by the British mandate, because the law under which he was convicted is from that era. “Maybe I need to turn to the queen or to Tony Blair in order to grant me justice,” he said. July 2nd, 2007. 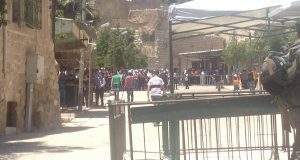 At the checkpoint by the Ibrahimi mosque, two human rights workers (HRWs) were monitoring the border police who were detaining every adult male Palestinian going to the afternoon prayer. At approximately 3 pm, right after the HRWs entered the area one female border police asked for their passports and detained them for 10 minutes. A policeman wrote down their passport info and asked about the purpose of their presence and to which organization they belonged. During the next two hours attempts to negotiate with border police and police were made, without any success. When the HRWs tried to communicate with several detained Palestinians, the border policemen ordered the Palestinians, as well as the HRWs to stop. At 5:25 pm a Palestinian boy, aged around 18 was detained. After another 5 minutes a border policeman asked him to follow him behind the checkpoint and started to body search him. One HRW asked the border police about the reason for their proceedings, while the other HRW kept filming the situation. The border policeman told the HRW that the arrested Palestinian was wanted by Israeli Police, but that he isn’t willing to give anymore detailed information to the HRW. When another Israeli police car arrived, one HRW made a new attempt to talk to the policeman, but the policeman ignored him. At the same time another border policemen repeatedly ordered the HRW who was filming, to turn off his camera and threatened to break his camera if he did not do so. At 5:33 pm the Palestinian boy was handcuffed, taken into the police car and brought to the police station of Kiryat Arba, which according to international law is an illegal settlement. Then the border police started to draw more attention to the presence of the HRWs. They ordered them leave the area immediately and when they refused they were threatened with arrest. Since the HRWs didn’t consider their presence as illegal, they refused to leave. A group of about five police man gathered around the HRWs and at the same time a border police jeep arrived. The border police asked the HRWs to hand over their passports, forced them to turn their faces to the wall and body searched them. Once more a border policeman gave the HRWs the ultimatum of leaving the area immediately or being arrested. After further discussion the HRWs left the place and went to a checkpoint down the road and continued doing their job there. At 6 pm as the HRWs wanted to leave the area, the border police denied them the right to pass the mosque and made them walk through, Shuhada Stret, which is closed by the Israeli military and is a commonly used street by violent Israeli settlers. July 2nd, 2007. At approximately 2 pm a water tanker was on its way to refill the water tanks of the Palestinian Abu Heikel family, living in Tel Rumeida, Hebron. Since their house is on the opposite side of the illegal Israeli settlement of Tel Rumeida, the truck had to take the road passing this settlement. When the truck tried to reach its destination, a group of approximately fifteen settlers went out of their homes, blocked the street and prevented the driver of going further. The truck spent about one hour in this miserable situation. During this time settlers were shouting at the truck driver and using a CD to reflect the sun into his eyes. 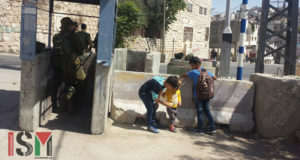 A couple of children made several attempts to enter the truck by stepping on the trucks stairs, while other settlers were throwing eggs at the trucks windshield. Several soldiers joined the scene and surrounded the drivers cab. Whether their purpose was to protect the driver or to join the settler’s harassments couldn’t be surely known. They did not do anything to prevent the settlers from blocking the road, therefore the truck had to go back down the hill and stopped at the nearby crossroads. When the house owner arrived he started negotiating with the police, which had already been there, because of another incident happening at the same time. After another hour the house owner went up the hill, with the police following him. At approximately 4.30 pm the truck was finally allowed to make another attempt to deliver his load. Without any further incidents he was able to reach the Abu Heikel family house and refill their water tanks. Starting on June 27th, 2007. Following the Israeli Occupation Forces’ (IOF) invasion of Nablus, from late Wednesday evening until early Friday morning, in which hundreds of Israeli troops in dozens of armored vehicles and bulldozers invaded the city and the Balata refugee camp, taking over numerous buildings and homes, blocking entrances to hospitals and schools, taking over radio stations, and eventually demolishing three homes in the old city, Human Rights Workers (HRWs) inspected the old city, visiting sites of IOF-demolished homes. Several houses in the old city were demolished using explosives. The residents of the homes were not given warning of the impending demolition, and in some cases were prevented from leaving the home. One resident, a Palestinian Red Crescent (PRC) medic described climbing out the 2nd story window and hanging onto the ledge in order to escape the collapse of the floor resulting from the demolition of the adjoining house. The father of a family whose home was demolished by explosives described how the IOF invaded the home around 5:30 pm on Thursday, collecting family members in one room and interrogating the sons on two occasions. The 2nd interrogation session took place in a bathroom, where the sons were badly beaten. Two young men of the family, ages 20 and 24, were arrested. The house was demolished shortly before midnight. The neighboring house, sharing a wall with the demolished home, also lost a 1st story ceiling-2nd story-floor due to Israeli explosives. Additionally, the weight-bearing wall was badly damaged, further endangering inhabitants sharing this wall. The mother of the family explained they had only just finished re-building after the last invasion. She further explained that had her sons been standing a few meters further away, they would have been killed in the collapse of the floor. In the Safadi home, 3 sons were arrested. The house was thoroughly trashed: Israeli soldiers burrowed into the kitchen floors in search of tunnels and weapons, and additionally ransacked the rooms of the home. While occupying the house, snipers were installed in windows strategically overlooking the alleys outside. The family was used as human shields while the IOF occupied the house. The Asali household suffered similar injustices. IOF soldiers also dug into the floor, opening a well and exploding a shared-family storage room on the ground level. Soldiers occupied the home from 8 am Thursday until the IOF left Friday morning, again placing snipers in the windows. Upstairs rooms were completely ransacked. Six Palestinians were kept captive in the house, as human shields, during the entire time of occupying the home. At 3 of Nablus’ hospitals —Al Watani, Rafidia, and Nablus Specialty Hospital—at least 2 Israeli military vehicles blocked entrances from Wednesday night until Friday morning, with soldiers preventing doctors, hospital staff and patients alike from entering, despite the urgency of doing so. According to Al Watani hospital staff, the army shot at the hospital with machine guns on 5 different occasions. IOF additionally delayed delivery of critical supply trucks like those bringing oxygen, as well as those with supplies for dialysis machines—most patients cannot survive long periods without dialysis, and further prevented delivery of food. The day after the army pulled out, HRWs visited the home of one Nablus old city resident who was held captive in one room of her home, along with approximately 40 other family members and neighbors, from Wednesday evening until Friday morning. In another room upstairs, approximately 50 neighbors were held, and a further 15 were kept in yet another room of the house. All were held under similar conditions. During their captivity, residents were neither given food or water, nor were they permitted to use the toilet, instead having to hold themselves or urinate in the room in which they were kept captive. Numerous elderly, children, and one pregnant woman suffered greatly under these circumstances. One elderly man was unable to take his vital medicine for nearly two days as it needed to be taken with food. Both the elderly woman and man developed severely swollen legs from remaining seated for nearly two days, needing to be carried out of the room when finally released from captivity. While occupying the home, soldiers urinated in the rooms as well as ransacked the house. Upon eventually leaving the home, one soldier tossed a hand grenade into the 2nd story window of the house still occupied by about 100 unarmed civilians, fortunately not resulting in any deaths but nonetheless adding to the damage done by the soldiers. This house-occupation was not an isolated instance. Numerous homes in the old city were appropriated and occupied, residents crammed into small rooms together and held without food, water, or visits to the toilet. The army was allegedly looking for “wanted men” (resistance fighters). The action of occupying homes and holding residents captive equates to using the civilians as human shields during the military invasion, a practice which is internationally recognized as illegal. In one instance on Thursday evening, soldiers took captive a Palestinian Medical Relief (PRM) volunteer who had been part of a group escorting civilians to their old city homes. Initially detaining the medic by asking for his ID, the soldiers further detained him by keeping the ID. Soldiers took the medic into the home they were occupying, holding him inside for over 30 minutes before he reappeared blindfolded and handcuffed at the door of the building. He was then made to squat in front of the building for approximately another 20 to 30 minutes while soldiers changed shifts. During this time, international HRW attempted to secure the medics release, citing the soldiers’ violations of international law in arresting and using the volunteer medic as a human shield. The HRWs inquiries and requests were met with refusals to release the medic and by the soldiers’ statements that they were not obligated to disclose the reasons for the medic’s detention. After numerous attempts to negotiate the medic’s release, HRWs had to leave the scene. It is unknown whether the PRM volunteer was harmed during his initial or later detention, though there is a high probability he was interrogated and beaten, as in other instances. The targeted arrest and detention of medics is common and is a form of collective punishment for these volunteers providing essential emergency services to wounded Palestinians. Volunteer medics typically are young Palestinian men, who the IOF routinely accuse of having involvement with militant groups. When not arrested, medics and ambulances are still routinely denied access to emergency areas, denying the wounded emergency attention, a tactic which can result in the deaths of the injured. On Friday morning, one paramedic, age 23, was shot in the shoulder while on duty. During this latest invasion of Nablus, at least 60 reported cases occurred as a direct result of the IOF army presence and actions. A further 15 routine but serious medical cases required the attention of the PRC whose movement was greatly restricted by the presence of the IOF. Injuries resulting from rubber bullet wounds numbered 48 in the span of 16 hours—these were only the injuries which were reported to and attended by the PRC. Among these cases, one 23 year old man was shot 4 times in the back and once in the chest with rubber bullets. There were also two reported cases of injury by live bullets. It is worth mentioning that these were all cases which the PRC was alerted to and do not include the injuries unreported to the PRC. Following a brief absence during the day on Friday, the occupying army re-entered the old city Friday evening and again Saturday evening, as happens on a regular basis in the Israeli military-surrounded city of Nablus. June 29th, 2007. At approximately 11.00 am a group of about 40 Palestinians, Israelis and internationals gathered in the fields of the Palestinian village of Artas to protest against the construction of the, according to international law, illegal Israeli Apartheid-Wall and to support a local farmer in entering his land. His fields are going to be ruined by the construction of a sewage-system for the nearby illegal Israeli settlement of Efrat, as well by the construction of the Apartheid-Wall. Approximately one month ago, Israeli military and bulldozers, uprooted about 40 apricot trees and forbid the owner to enter his area. When the demonstrators were about to proceed to the uprooted area, where a part of the sewage-system has already been constructed, the way was immediately blocked by about 15 soldiers, preventing the demonstration of going further. After a couple of minutes and several attempts to negotiate with the soldiers, the Israeli military surprisingly allowed the Palestinian farmer and his supporters to enter his land. The next 30 minutes were spent, by an impassioned and moving speech. The land owner and some other Palestinians explained their miserable situation to the present media, as well as to the international activists, and asked them not to stay silent in the face of the injustice and oppression they have seen, but to spread their messages all over the world. Despite one incident of unprovoked violence against a Palestinian, the demonstration in Artas was a successful and enjoyable time for all of the demonstrators present. Since it was the first time in 40 days, that the farmer has been allowed to enter his field, the demonstrators reached their aim in a peaceful way, without any people being arrested or injured. The demonstration concluded by the farmers offering to all the activists, to get fruit from his trees, which everybody was happy to do. Help save the Palestinian inhabitants of Susya from eviction! On June 6, 2007, a final Israeli Supreme Court hearing was held on the appeal of the Palestinian residents of Susya, in the southern edge of the West Bank. The deliberations – carried out since 2001 (appeal # 7530/01) – was against the destruction of the Palestinians’ homes. The Court has basically accepted the state’s argument, that the residents are squatters, even though they are the legal owners of the land. This is because they have built their homes (after being evicted once before) without permit, and therefore the homes must be destroyed. Since Palestinian Susya is in “area C”, the authority to issue permits rests with the settler-run Civil Administration bureau, situated in a settlement in the northern part of the West Bank. There is no end to the cynicism of the settlers, the IDF, the Civil Administration, and even the Court towards Susya Palestinians. It is well known, that the above-mentioned bureau does not give permits to Palestinians. Some residents have submitted permits in the past – only to be turned down repeatedly. At bottom line, even though the State admits the land is private Palestinian land, it prevents Palestinians from living on it. At the same time, settlement outposts in the same region are expanding, many of them also built on private Palestinian land. Will the Minister of Security and the Israeli government now approve the eviction of 13 Palestinian families attempting to continue to live on their land and tilling their fields – or will it cater to the settlers’ expansionism and explicit wishes to “clear” the area of its original residents? It is also up to you. Please act. The morning of June 30th, 2007. 12 human rights workers (HRWs), members of the ISM, CPT, EAPPI, and residents of surrounding villages went to visit a family in the village of Susiya in the Southern Hebron region. The Susiya Village, located 20 km outside of the Hebron area, is a poverty-stricken zone which Palestinian families have called home since the 1830’s. The land was once a place of many caves and homes. The homes and caves have been demolished, rebuilt, and demolished again by Israeli settlers, with the full support of the Israeli government. Susiya Village is located between Susya settlement and the ruins of an old synagogue. The settlers therefore want to connect the settlement with the synagogue. Some of the Palestinian land owners have deeds for their lands, some do not. This makes no difference however, as the Palestinians are not allowed to use their lands as the area is officially declared a closed military zone. The Palestinian residents have suffered from the sabotage of their land and property by settlers and soldiers. The have had their houses and wells demolished, their goats killed and their roads blocked. The case of Susiya is especially important since it may become a precedent for other villages in A3. The people living in Susiya earlier made their living from agriculture and without their lands they have no income. Uniting the nearby villages in the struggle for their lands is critically important. Soldiers, police and settlers are working together to permanently annex Susiya’s land. Palestinian complaints are, regularly taken by the police, filed, but not followed through on. Israeli propaganda has flipped the truth and that is why it is important for Susiya to get attention from the outside. The HRWs were taken on a tour around the lands, were shown demolished houses and caves, and for the first time in several years the presence of internationals made it possible for Palestinians to walk on the road to Yatta. This was the beginning of a continued international presence in Susiya, aiming to support them in their struggle. June 29th, 2007. On Friday evening about 20 human rights workers including members of ISM, EAPPI and CPT went to the Jabari family home which is situated on land between the Kiryat Arba and Givat Havot settlements. Settlers have constructed a footpath crossing the Jabari’s land in order to connect Kiryat Arba to Givat Havot. In 2002, settlers erected a tent on the Jabari’s land which they call a synagogue. The tent was dismantled twice by the Israeli Occupation Forces (IOF) but the settlers rebuilt it. Currently there are no plans to dismantle the tent, instead the settlers are not supposed to enter it. If this is not making any sense to you, then you are not the only one. I can’t make any sense of it either. The Jabari family asked members of the human rights groups to accompany them to their land so they could clear the dried grass and prepare the land to be used agriculturally again. The family has not used the land in the last six years, because of settler harassment, especially from settlement guards who are stationed across the street. This is despite a court order allowing them to do so. In the past, the family grazed their sheep and goats and cultivated fig trees and grapes on the land. We arrived on the land and began pulling up the grass and packing it into bags for the animals to eat. The family eventually plans to plant olive trees on the land. We called the Israeli police before we got there to alert them to what we would be doing so they would be present to prevent any mischief and interference from settlers. Last time the International Solidarity Movement (ISM) came here, settlers prepared breakfast in the form of eggs and tomatoes to the head. The army and police eventually showed up and stood around but did not try to interfere. Settlers came and went; one placed a chair on the footpath, produced a Torah, and began praying. The greatest thing about the action was that the family was able to bring their goats onto the land to help finish the work. Fear of settlers harassing the family and hurting the goats had prevented them from doing this for a long time. We left as it began to grow dark, but not before we had tea and snacks and some of use got to ride the Jabari’s Arabian horse! The walk back to Tel Rumeida was chock-full of the usual settler and soldier shenanigans which Hebron is known for. Palestinians are prevented from driving cars on the road that splits Kiryat Arba and Givat Havot. So they walk, or ride bikes, or ride horses. Oops, wait, I take that back, they can walk their horses, but they can’t ride them. A couple of Palestinians on horseback rode down the street and were ordered off the horses by soldiers. It was like they were in the 6th grade and the hall monitor was telling them not to ride their bike in the hall. Except it was some teenaged soldiers telling 30 year old men they had to walk their horses. Walking down worshipper’s way we were greeted by settler saliva and rocks as they passed us on the way back from the Ibrahimi mosque/synagogue back to Kiryat Arba. We informed the army of this and as usual they did nothing. At the mosque, Issa, our fearless Palestinian ISM coordinator was detained by soldiers who asked for his ID and searched his bag. In the meantime, another soldier had spirited away a teenaged member of the Jabari family who had been accompanying us. The soldier took him over to a dark corner and it was a minute or so before we realized that the soldier was violently searching the boy and punching him in the stomach. As soon as we noticed and started screaming at the soldier, he stopped and released the boy. The is something I have seen quite frequently, soldiers in Hebron will not beat a Palestinian if they know human rights workers are watching, so they try to sneak them away to someplace where we can’t see and as soon as they are discovered, they stop because they know what they are doing is wrong. In the future, the local human rights groups plan to continue to accompany the Jabari’s to their land so they can begin cultivating it once more. After approximately an hour and 10 minutes the police arrived but they drove off without even questioning why the boys where detained. After another 35 minutes the police came back and took the two boys away in a police car with two police officers in the front seats and two soldiers in the back with the boys. The father of one of the boys tried to get into the car with his son but he was blocked by the soldiers. The boys returned after 15 minutes. The police had taken them around in the car while the soldiers asked them different questions. One of the boys told an international HRW about the tour in the police car afterwards. He said that his friend answered a question from one of the soldiers and that the soldier replied by hitting him on his cheek. June 29th, 2007. The Israeli Occupation Forces (IOF) is currently invading the city of Nablus again after they retreated early this morning from the old city. IOF invaded the northern West Bank city of Nablus Wednesday night after midnight, calling a curfew, demolishing road blocks, and performing house-to-house searches for resistance fighters. Announcements over loudspeakers and local radio stations instructed Palestinians to go inside their homes and declared much of the city a closed military zone, including areas where resistance fighters are suspected to be, such as schools, banks, taxi stations, and markets. Two military helicopters patrolled the skies over the old city and the Balata refugee camp from morning to afternoon. The old city and Balata further suffered loss of electricity as the power supply to both areas was cut. Palestinian sources reported over 80 army vehicles, including hummers, jeeps, and heavily-armored jeeps, within the old city, not including those vehicles outside the old city. Bulldozers removed road blocks at the many road entrances to the old city, facilitating later entry of army jeeps. 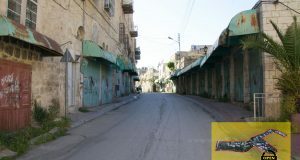 Numerous houses and several buildings were occupied by the IOF and turned into military bases and lookout points, including the Soosa, Ahmed al Bizray, and Fatyr buildings. Two Nablus hospitals, Rafidia and al Watani, were surrounded and occupied by military forces, and the oxygen supply to al Watani hospital was cut. Palestinian and international Human Rights Workers patrolled areas of the old city last night, accompanying Palestinians to their homes and engaging with soldiers to allow safe passage of the civilians. After the day’s invasion yesterday, at least 8 Palestinian civilians were wounded by rubber bullets, with over 8 arrested. An additional 8 Israeli soldiers were injured by Palestinian explosions inside the occupied city. While the reason given for the invasion was the search for wanted resistance fighters, the Israeli Occupation army left in its wake 3 demolished houses, destroyed by explosions, which both international humanitarian volunteers and Palestinian Medical Relief workers were prevented access to. It is yet unknown how many have been wounded or killed in these late night demolitions. The neighborhood around the demolished houses was declared a “closed military zone” and ambulances were prevented from approaching to offer aid. In the course of accompanying Palestinian civilians back to their homes in the old city, 3 medical relief workers were arrested without cause, despite the efforts of other aid workers and international human rights workers to have them released. All three are believed to have been later released, one badly beaten by soldiers. The day’s activities left a toll of at least 8 known wounded, 3 demolished homes, at least 3 arrested civilians, and substantial destroyed infrastructure. June 29th 2007. Many internationals and Israelis joined today the Palestinian residents of the village of Bil’in in their weekly demonstration against the Apartheid Wall and the occupation – and of course in solidarity with Iyad Bornat, who has been arrested since the previous demonstration. As usual, the peaceful demonstrators, among them many children, chanting and holding Palestinian flags, tried to reach the Wall/Fence. As soon as the first demonstrators arrived at the point of the road where the soldiers had put barbed wire, the soldiers started to shoot tear gas canisters at them. Because of the amount of tear gas, the direction of the wind and the high temperature, the majority of the demonstrators were forced to step back. Two Palestinians, an Israeli and three Internationals managed to stay at the area despite the soldiers bombardment of teargas. A teargas canister nearly hit one of the internationals in the leg. An Israeli demonstrator, former soldier of Golani battalion, was in the front talking for a long time to the soldiers, through a huge cloud of gas. A Palestinian member of the Popular Committee of Bil’in and an international tried to extinguish a small fire caused by the gas canisters. A few more internationals and Palestinians managed to reach the area. But finally the soldiers attacked the peaceful demonstrators with gas and sound bombs, and they arrested the Israeli demonstrator. Later we were informed that there was also an Israeli woman arrested. The demonstrators tried several times to step forward again, but they were dispersed with teargas and rubber bullets. Palestinian residents of Bil’in, some of them children, also faced the same treatment while there were trying to collect the gas canisters. At approximately 6:30 pm on Monday, June 25, two Human Rights workers were alerted to a stoning incident at the home of Hashem, directly below the Israeli Tel Rumeida settlement in the H2 area of Hebron, which is under Israeli military control. Upon their arrival, the settlers living in the house of Baruch Marzel above the Palestinian home temporarily ceased their aggression against their neighbors. Approximately 15 minutes later, the settlers began throwing stones and bottles down once more, ceasing again after a few minutes. Hashem informed the HR workers that the throwing of stones, bottles, fruit and vegetables Monday had begun earlier, around 16:30 that afternoon, lasting for half an hour. The settlers, including an adult woman and two children, resumed throwing stones and other objects around 20:00, again for approximately half an hour, and later again at around 23:00 for half an hour. In the two latter incidences, Hashem was able to videotape the settlers’ throwing of objects at his home. Hashem further related that this sort of aggressive behavior has been occurring on a nightly basis for an extended time, attacking the homes of Hashem and his neighbors on either side. Over the past months, the settlers in the home above have thrown a variety of rocks, bottles, fruit, vegetables, and even a dish washer into the back garden. The washing machine was aimed at Hashem as he attempted to clear out some of the rubbish from previous attacks. The machine was followed by a small boulder, also aimed at Hashem. Settlers have also trespassed on Hashem’s land on different occasions, vandalizing his property by cutting all but one of the grape trees around his home and spraying graffiti on the walls. As with earlier incidents, Hashem followed up the stoning by formally lodging a complaint with the police. Allenby Bridge a strange and unknown name for a lot of people around the world but for Palestinians it is a well known name. It is the name of the bridge which connects the West Bank with the outside world. It is located between Palestine and Jordan on the Jordan River. The important thing is that it is the only road that we know to travel outside Palestine from the West Bank side. But what are the Violations behind This Bridge? Only few kilometers between Palestine and Jordan need 10 hours at least to be crossed. The story starts when you reach Jericho and suddenly you are faced with hundreds or maybe thousands of Palestinians standing there and waiting their turn to ride the bus which they will share the trip along the bridge. First, the Palestinian Authority checks you. Fortunately this check does not take a lot of time. Then same bus carries you to face an Israeli check point, and the driver of the bus says “Please all of you go out to be checked any metal you have to put it on table.” An Israeli soldier sitting in a small room will check you and check if you have ID or passport. Then you ride another bus which leads you to the main station of Israeli military where they inspect your body more closely. When you go down from the bus you face an electronic inspection machine where you must put all metal on the table, then you enter the main building. Same as before you have to put every thing and enter. All these procedures take a lot of time. Maybe all these procedures seem normal but when you go and give the Israeli border police your passport the situation will be different. What you feel that this person who is sitting in this small and modern room controls your life and your future. It is not a fear only it is the truth because if he says to you “Ok you have to sit on the chair and wait until we call you”. This means that maybe you will not be allowed to go outside Palestine because of security reasons so your hopes for work or study or even tourism outside will disappear in a moment. The story does not end here, sometimes the Israeli intelligent request you stay on the bride for hours, in this case you stay there until they close the bridge then you must go back later to try again to pass the bridge to Jordan. In last time I traveled with my friend from Hebron, it took from us 12 hours to reach Amman. It was a very hard day all people are racing to finish and reach first to the other end of the bridge. I waited with my friend whose name is Tareq in Jericho from 8:00 to 12:00 to have a seat in one of the buses which transfers us over the bridge. I tried to enjoy my time, but it is not easy to wait for four hours because you are very tense because you do not know if you will cross the bridge or not before the day is finished. I told Tareq that we must go and sit away from this crowded and hard situation so I took him with me to sit under a big tree and listened to Fayrooz songs from my laptop. We slept after a while and the time ran faster than before. We hoped to stay all our day under that tree but in the same time we have to continue our trip before bridge closing. We rode the bus after our turn came and the trip over the bridge started. It seems that the bus walking 1 km/hour. All the people were looking ahead to see how many buses are in front of them. The Israelis check all people in the buses at three different points so the trip takes a lot of time. We waited until we reached the main point where Israelis take passports to check them on the computer. Tareq was a problem because they stopped him and I had to wait for him at the same time. So we were delayed more and more. Fortunately they did not make an interview with him because they did it just month ago when he entered from Jordan to Palestine so we were happy to a cross the Israeli check points safely. This long travel requires a lot of patience from any one who tries to travel outside Palestine. But all these harassments will not prevent us from hoping and continuing our life. Everything that is going on at these borders is just a stupid waste of time and procedures that aim to degrade Palestinians and make their life in their country like a prison.